of 3.5 - 6.0 mm in diameter, all Snake Chain are made of solid silver wire plaited, available from a length of 40.0 cm in 5cm increments. diameter, all Snake Chain are made of solid silver wire plaited, available from a length of 40.0 cm in 5cm increments. Snake chain elliptica Length 40,0 cm with karabiner lock, a very light pleasant wearing silver necklace for the women. Snake chain elliptica Length 100,0 cm with karabiner lock, a very light pleasant wearing silver necklace for the women. Snake chain elliptica Length 95,0 cm with karabiner lock, a very light pleasant wearing silver necklace for the women. Snake chain elliptica Length 90,0 cm with karabiner lock, a very light pleasant wearing silver necklace for the women. Snake chain elliptica Length 85,0 cm with karabiner lock, a very light pleasant wearing silver necklace for the women. Snake chain elliptica Length 80,0 cm with karabiner lock, a very light pleasant wearing silver necklace for the women. Snake chain elliptica Length 75,0 cm with karabiner lock, a very light pleasant wearing silver necklace for the women. Snake chain elliptica Length 70,0 cm with karabiner lock, a very light pleasant wearing silver necklace for the women. Snake chain elliptica Length 65,0 cm with karabiner lock, a very light pleasant wearing silver necklace for the women. Snake chain elliptica Length 60,0 cm with karabiner lock, a very light pleasant wearing silver necklace for the women. 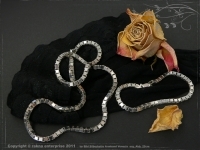 Snake chain elliptica Length 55,0 cm with karabiner lock, a very light pleasant wearing silver necklace for the women. Snake chain elliptica Length 50,0 cm with karabiner lock, a very light pleasant wearing silver necklace for the women.